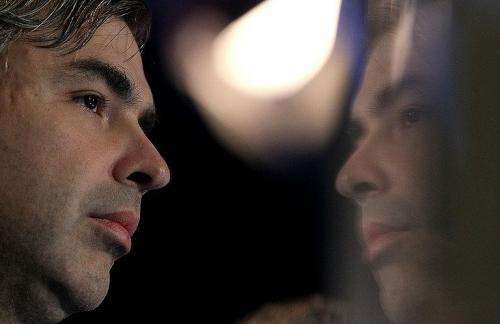 Oracle is asking a US judge to order Google co-founder Larry Page to undergo questioning in a patent suit pitting the business software titan against the Internet giant. "(Page) reportedly made the decision to acquire Android Inc., and thereby develop and launch the platform that Oracle now contends infringes its patents and copyrights," Oracle lawyers said in a letter to the court. "Oracle believes that Mr. Page's testimony will likely be relevant with respect to a number of other key issues in this case as well, including the value of the infringement to Google," the letter continued. Oracle pointed out to US Judge Donna Ryu that Google has asked to depose its chief executive, Larry Ellison, in the case. Oracle is accusing Google's Android software of infringing on Java computer programming language patents held by Oracle stemming from its recent purchase of Java inventor Sun Microsystems. Google has denied the patent infringement claims and said it believes mobile phone makers and other users of its open-source Android operating system are entitled to use the Java technology in dispute. Oracle already deposed Google senior vice president of mobile Andy Rubin, a co-founder of the Android startup that Google bought in 2005. Google opposes the bid to question Page and three other current or former executives in the final weeks of the discovery process, arguing that Oracle was "gnashing its teeth with an eleventh-hour attempt to cram" in more depositions. Page could wind up testifying, given a notice by District Court Judge William Alsup that he intends to dig into whether Google opted to infringe on Sun patents to avoid the cost of licensing the technology. "It appears possible that early on Google recognized that it would infringe patents protecting at least part of Java, entered into negotiations with Sun to obtain a license for use in Android, then abandoned the negotiations as too expensive, and pushed home with Android without any license at all," Alsup said Tuesday in court documents. Alsup advised Oracle and Google to be prepared to address the issue at a hearing in US District Court for the Northern District of California in San Francisco. Google has maintained that Sun, before it was acquired by Oracle, had declared that Java would be open-source, allowing any software developer to use it, and released some of its source code in 2006 and 2007. Oracle completed its acquisition of Sun, a one-time Silicon Valley star, in January of 2010 and subsequently filed suit against Google. Google-backed Android software is used in an array of devices that have been gaining ground in the hotly competitive global smartphone and tablet markets. Oracle - Milking software process patents (the most ridiculous kind of patent known to man) for all it's worth.